In this article we'll cover some important optimization steps you can apply now. And these actions tell Google and the other search engines exactly what your pages are about. And the best news is when compared to off-page SEO, on-page SEO is easier because it's more within your control. As a business owner you might tend to overlook the significance of on-page SEO because you've been told backlinks are all you need for great SEO. Backlinks certainly have their say - in fact, they have the biggest impact on how high a website fares in search engines. But these external links are only half the story. The other part is on-page SEO, which also adds a lot of diversity to your website's SEO profile. So What is On-Page SEO? On-page SEO is the practice of optimizing individual web pages in order to rank higher and earn​ more relevant traffic in search engines. Notice that it says "...in order to rank higher and earn more relevant traffic". Because the higher you rank the more people searching for what you sell will discover your business. And those visiting your site will be far more qualified leads. First, your content needs to be written for your readers. This means you focus on providing valuable information about your products or services with the goal of helping the reader understand the advantages of choosing your business over the competition. Of course, people must first be able to find your site and that's the job of SEO. Creating great content for your site's visitors is just the first step. Now you must tell the search engines what your page is about. How do search engines read your content? It's important you understand that search engines don't see your content the way a human does ... mainly because the search engines use programmed robots or spiders to crawl your site's content and collect data. Google's web crawler is known as GoogleBot. Crawling is the process by which Googlebot discovers new and updated pages to be added to the Google index. So on page SEO is basically making sure the bot finds and gets the correct data about your page and adds it to their index. Like every other aspect of SEO, on-page ranking factors must also get updated with time. Therefore, it's important you stay atop these updates to tame the on-page SEO crawler every time. Keywords then are the words or phrases a person uses to find whatever it is they are looking for. It's helpful for you to think like your ideal customer ... ask yourself what words or combination of words might they use to find the exact information your site page is all about? 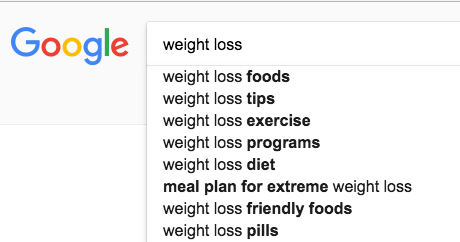 For example if your page is about weight loss, some common keywords a searcher might use could be dieting plans, weight loss programs, weight loss exercises and so on. • How Do You Find the Best Keywords to Use? For starters, consider what you already know about your best customers. You probably already know a lot of the common questions and concerns they have that your product or service provides the solution for. Those same questions and concerns contain the types of keywords prospects will use to search for solutions to their problem. What you're looking for are the problems you can solve with your products or services. Go to Google and type in some of those keywords and note what kind of content is returned. If you see content similar to what your page is about then you will want to optimize your page for those keywords. Also, look at the suggestions Google provides. 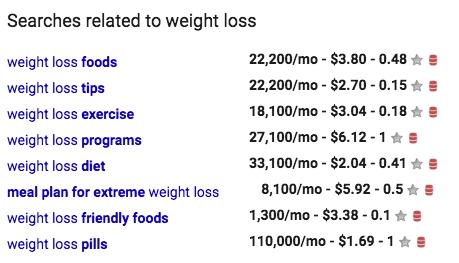 As in our example, when you enter the search term 'weight loss' the image below shows additional related search terms. You can also install SEOquake which is a free browser extension. It's available for Chrome, Firefox, Opera & Safari. SEOquake provides you with key SEO metrics such as how many people search for a particular keyword every month. Scroll to the bottom of the page after you enter a search term. You'll see related search terms and an example of the SEO metrics from SEOquake (as shown in the image on the right). The 1st metric is how many people are searching for that term every month. Another excellent tool to help you find keywords is Keywords Everywhere. The Keywords Everywhere extension is a free keyword tool. It can be easily installed on either Chrome or Firefox. In addition to providing more related keywords, it also shows you useful data about google keyword search volume, cost per click and competition data of keywords on multiple websites. A title tag outlines what your web page is about. For example the title of this page is On-Page SEO. Search engines such as Google always look at title tags and compare them to a page's main content. Therefore, a web page's title tag must always have the keyword a particular page is trying to rank for. Title tags are, in fact, among the most important on-page ranking factors. By the way, keywords in title tags have more weight if they appear in the initial half of the title. A meta description indicates what users would find on a particular page without them having to visit the page. The meta description is a snippet of up to about 160 characters – a tag in HTML – which summarizes a page’s content. Using a plugin such as Yo​ast SEO makes adding your meta description very easy ... no coding knowledge needed. See below for how easy Yoast makes adding this snippet to your page. Though not a major ranking factor, online search engines peruse these descriptions to ascertain the topic of a page and the correct audience for it. Search engines show the meta description in search results mostly when the searched-for phrase is within the description. So optimizing the meta description is crucial for on-page SEO. Your web page's URL should ideally be keyword-rich and short. URLs that have the post number, date, etc. are a bit on the longer side and do not go down as great URLs. URLS must have no or the least amount of folders for the respective pages to rank well. Also, every word in the URL must be differentiated using a hyphen (-) or a forward slash (/) instead of an underscore (_). The longer the content, the more time the user would spend on the site. This would automatically positively influence the page's search ranking. There are several studies done by industry professionals that throw light on the positive impact that longer content has on a web page or site's ranking. The best pages are those that cover an entire topic in-depth. The key to in-depth and comprehensive content is to provide your readers with everything they need in one place. Dwell Time is how long a Google searcher spends on your page. When a visitor to your website finds what they are looking for they will spend more time consuming the content. If a user doesn't spend a long enough time on your site and hits the back button almost as soon as they land on your website, it either means the content is low-quality or doesn’t provide the answers they were looking for. This is known as the bounce rate. The longer a visitor remains on the site, the lower the bounce rate. This is important in the eyes of search engines since their goal is to provide the searcher with the best results. Thus a high bounce rate will cause a lowering in the ranking for that content. One easy way you can increase dwell time is by posting engaging, in-depth articles that keep visitors interested so they remain on your site longer. The title of a web page should be wrapped in heading [h1] tags. H1 tags are basically headline tags. If you're using a CMS (content management system), getting the h1 tags right should not be much of a problem because a CMS adds the tag as its default. There are also different levels of heading tags (h2, h3, h4, h5 & h6). These are also known as subheadings. Google likes indexing the content from the headings and even gives priority to it rather than the actual text that you are using. Subheadings also help the viewer, especially those who scan your page, which many of your visitors will do. These subheadings break your content into the various sections or key points your article covers. Scanners can quickly find the parts of your content that are important to them. By including engaging videos, images and diagrams you can help decrease bounce rate by augmenting the total time a visitor spends on your site. Not only does using videos and graphics make your pages look more appealing, they help illustrate the points your text makes. Few visitors find a page filled with only text very inviting. Both total time spent on a site and the site’s bounce rate influence the ranking of a web page. So it’s vital you make the page content as informative and visually appealing as possible. The goal of every page should focus on increasing total time spent on your site and keeping the bounce rate as low as possible. Both these factors will impact your overall rankings. Make sure at least one image file name includes your target keyword (for example, on-page-SEO.png). Filenames are often used for the image’s snippet in Google's image search results. So name your image files with users in mind. This may also bring additional traffic to your site. It’s also important that your target keyword is part of your image Alt Text. For example on the image at the top of this page I used this: alt="​on-page-seo-process". When you hover your cursor over a properly optimized image, you will notice a pop-up of the image's title in some browsers. The speed with which your pages load is a very significant on-page ranking factor. Many people will simply leave if a site takes too long to load. This is especially true when they are using a mobile device such as their smart phone. And most users are unlikely to revisit a website if it takes more than four seconds to load completely. Search engines have taken note of this and have therefore made website speed an important on-page SEO factor. There are a number of places online where you can check your site speed. A good one I like to use is the Pingdom website speed test. You enter the url of the page you want to do a speed check on. Then choose a location from the drop down menu on the right. Click the start test button and you'll get an analysis of the page speed. Not only will you get a summary of your site's speed, but you'll also get a list of suggestions to help you improve the speed. Go ahead and check your site's speed now and see how it does. Just click this link: Pingdom website speed test. If your site is experiencing speed issues, its speed can be boosted by compressing images and upgrading your hosting plan. You may also consider changing your site host if speed is a problem with your current server. The keyword you're targeting should ideally appear within the first 100 words of your post. Secondary and related keywords may then be used sporadically in the remaining parts of the article. Such keyword positioning makes connecting the title and content quite a bit easier for both search engine robots and your readers. Inbound links or backlinks get talked about a lot in the SEO world. Unfortunately, outbound links do not spur the same level of discussion within SEO circles. Though outbound links aren't as effective as inbound links, they still do matter. These links direct the user to related pages on the web, helping them learn more about the particular topic. Outbound links also help the search engines figure out the topic of your page. And linking out to authority sites shows Google your page is providing quality information. Notice throughout this article I have included a number of outbound links. I do this whenever I feel it gives you additional information. It also lets you know the source of certain content. Every post should have at least two to three internal links. In other words you want to provide links to related content on your site. Sites such as Wikipedia send several links to its internal pages, which is one of the reasons why content-rich sites do so well in search engines. Internal links improve user experience by helping them locate related content on your site. This also means readers would have more options or reasons to stay on the site. If a reader has to manually type in keywords to locate specific content on the site, the majority would choose to exit the site instead. Social signals do not necessarily have a direct or major impact on a site's ranking. However, these social shares mean a lot more people end up seeing your content, which increases the likelihood of more people backlinking to your page. Needless to say, social sharing buttons make it easier for readers to share content. On-page SEO is extremely important if you want your website to rank well in the search engines. But it's not only for ranking well ... it also helps you get more qualified visitors to your site. Compared with off-site SEO it is also easier since you have more control when optimizing the various parts of your site's content. 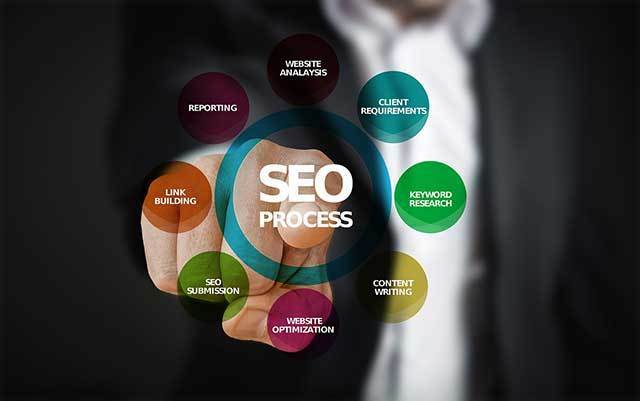 On-page SEO is how you insure the search engines understand what each of your pages are about and accurately add your content to their data base. Keywords are the words and phrases people use to search for the information they need. 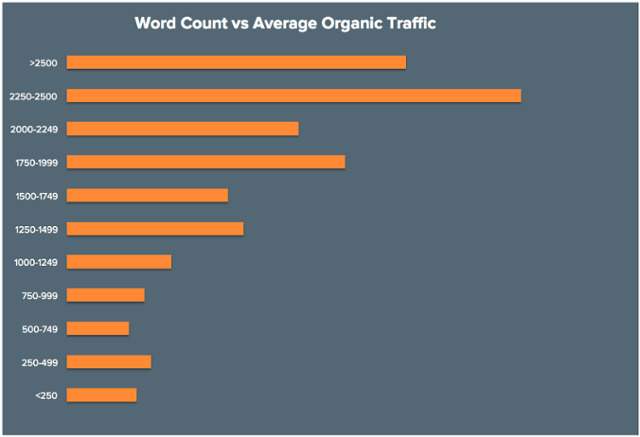 You want to optimize your content for as many search terms as possible. Thus, when people search for information about the products or services you provide, your correctly optimized pages will help them find you and bring you more qualified leads. Title tags, meta descriptions, seo friendly urls ... when optimized properly they all help your ideal prospect find your business. Formatting your web pages with interesting graphics, sub-headings and detailed content that engages your visitors makes it easy for them to find exactly what they are looking for. When your content is done well, visitors spend more time on your site. And if they find your content valuable they are more likely to contact you or visit your store. ​Can you see why on-page SEO plays such an important role in increasing traffic, getting more qualified leads and ultimately more customers? Let me know what on-page SEO tips you want to implement immediately?